In this two day course, students will learn step-by-step how to produce elegant settings for diamonds and coloured stones. The course will cover basic setting techniques and rub over collets. The course is aimed at intermediate / advanced makers, not for beginners. 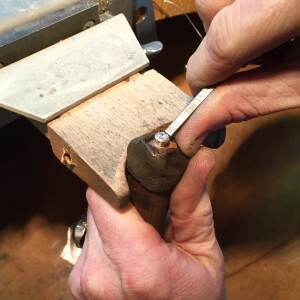 Sawing, filing, soldering knowledge is necessary. Students who have some experience in jewellery will find this course challenging and informative. Students will learn to produce several types of collets for stone setting and gain basic rub-over setting skills. The course runs on both Saturday and Sunday, 9:30am – 3.00pm. Max of nine places available. Full Payment required to secure a place. A minimum of six participants required for the course to run. We can take card payments over the phone – please note the cost of the day is not refundable. Once payment is received we will send a letter confirming your place on the course – just let us know if you would like a place by calling 01582 833800.